In the 1950s and 60s, two Belgian herpetologists suspected the occurrence of a new-to-science species of skink based on specimens from Angola and the Democratic Republic of the Congo. But neither of them got around to describing the species in their lifetimes. Now, a team of researchers surveying amphibians and reptiles in Cagandala National Park in Angola have formally described the long-tailed skink in a new study. 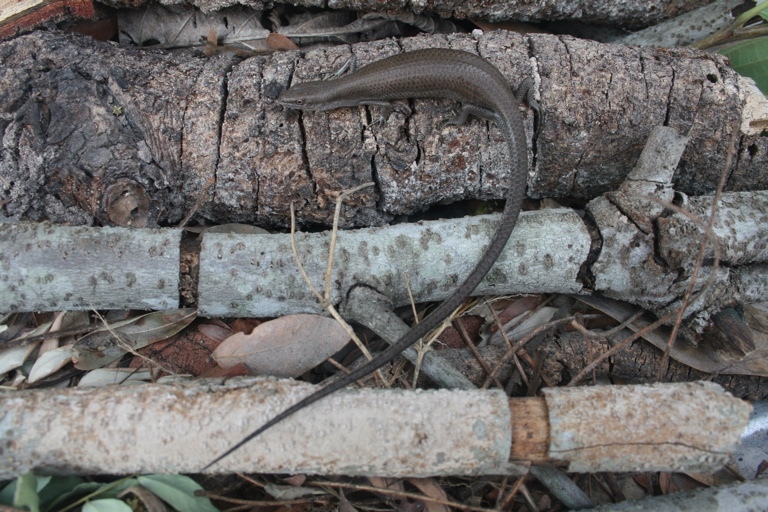 Named Trachylepis raymondlaurenti or Laurent’s long tailed skink in honor of Raymond Laurent, the researchers suggest a conservation status of Least Concern for the skink for now. Researchers have finally described a new species of skink from Angola, specimens of which have lurked on museum shelves for more than 70 years. Belgian herpetologist Raymond Laurent first suspected that he was dealing with a new species of skink back in the 1960s based on specimens collected from both Angola and the Democratic Republic of the Congo (DRC). However, Laurent decided to let his Belgian colleague Gaston de Witte, who had been the first to study the more-numerous DRC specimens in the 1950s, take the lead on describing the skink. As it turns out, neither of them got around to doing it in their lifetime. Now, a team of researchers surveying amphibians and reptiles in Cangandala National Park (CNP) in Angola have formally described the long-tailed skink in a new study published in Zootaxa. Laurent’s long tailed skink. Image by Luis Ceríaco. Marques and her colleagues also used Laurent and de Witte’s published works to locate some of the older specimens, now placed in the collections of the Dundo Museum in Angola, the Royal Belgian Institute of Natural Sciences (RBINS) in Belgium, as well as the Museum of Comparative Zoology, Harvard, U.S. The team then analyzed the specimens’ bodies as well as DNA to conclude that they belonged to a new-to-science species of skink. The lizard-like animal, with an elongated body and a very long tail that’s more than twice its body length (from its nose to the base of its tail), has been named Trachylepis raymondlaurenti or Laurent’s long tailed skink, in honor of the Belgian herpetologist. Since the Laurent’s long tailed skink has been found in conservation areas in both Angola and DRC, the researchers say that it possibly occurs over a large area, and suggest a conservation status of Least Concern on the IUCN Red List for now. 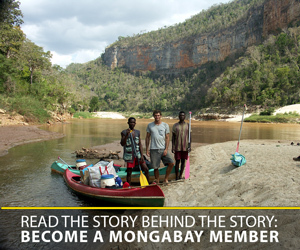 The team also has not found evidence of the new species being used by the local populations or within the pet trade. A formal conservation assessment would, however, be needed to properly evaluate the species’ conservation status, the researchers say. 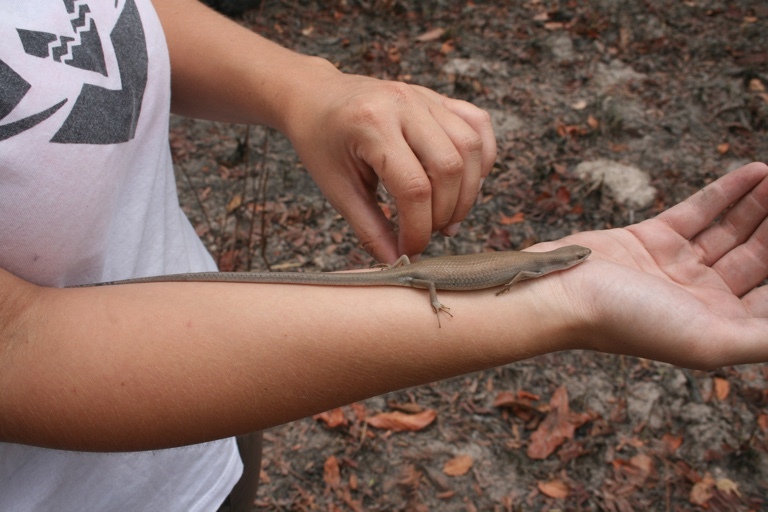 The new species of skink has a very long tail. Image by Luis Ceríaco. Marquez, M. P., Ceríaco, L. M., Bandeira, S., Pauwels, O. S., & Bauer, A. M. (2019). Description of a new long-tailed skink (Scincidae: Trachylepis) from Angola and the Democratic Republic of the Congo. Zootaxa, 4568(1), 51-68. Banner image of Laurent’s long tailed skink by Luis Ceríaco.